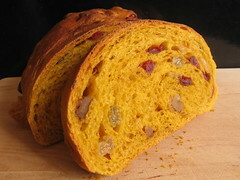 Cranberry-Walnut Pumpkin Loaves - Do You Know The Muffin Man? Notes: A Google search found a post I made to a bread mailing list back in 2003 when I first tried this bread. This time around, I used canned pumpkin (less moisture then fresh squash) and I have a stand mixer, so no problems with kneading the soft dough. Alterations: all-purpose flour instead of bread flour; dried cranberries instead of fresh/frozen; plumping the raisins and crans in some spiced tea; two 8×4" pans instead of three smaller ones. This bread has an extended fermentation period: my schedule was to mix the dough in the morning, let it rise for about two hours, into the fridge while I was at work, take it out when I got home, then bake it at night. Quite a nice vibrantly coloured loaf, but I would increase the spices next time.